Register Now for the Child Abuse Prevention Conference! Keynote speaker: Claire M. Louge, M.Ed. 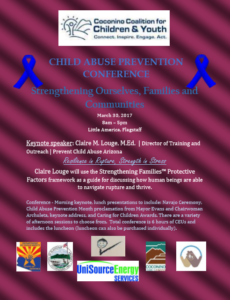 | Director of Training and Outreach | Prevent Child Abuse Arizona Resilience in Rupture, Strength in Stress Claire Louge will use the Strengthening Families™ Protective Factors framework as a guide for discussing how human beings are able to navigate rupture and thrive. Conference – Morning keynote, lunch presentations to include: Navajo Ceremony, Child Abuse Prevention Month proclamation from Mayor Evans and Chairwoman Archuleta, keynote address, and Caring for Children Awards. There are a variety of afternoon sessions to choose from. Total conference is 6 hours of CEUs and includes the luncheon (luncheon can also be purchased individually). Click on the flyer for the full outline of the conference! Register here today! Registration deadline is March 20th! « Dream Big is Coming!